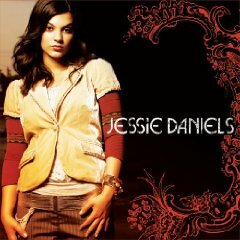 Jessie Daniels (born in New York in 1988) is an American actress, songwriter, and Christian musician. She has been acting since she was eight, appearing in independent films and commercials for Lifetime Television and MTV. She has also appeared in musical theater and off-Broadway plays. But what Daniels loved more than anything was music, particularly singing. And it wasn’t too long before shed have the opportunity to showcase the skills that eventually led to her life’s calling. Growing up in what she describes as a very loud, Italian Catholic family, Daniels was active in her home church. "I always knew about God, but never really realized you can have a relationship with Him," Daniels remembers. "It wasn't until I attended church with a Christian friend that my heart really began to change. For the first time, I experienced God in a real way and saw something new I wanted to commit myself to." It was during this time that Jessie also realized there was far more to performing than simply entertaining people. "I remember thinking "God, I want to use my singing for you. Lead me." A few months later, Daniels traveled to Nashville to check out the musical possibilities, and it blossomed from there. In 2003, Daniels began writing and recording her first project, a six-song EP she released independently on her Web site. Before long, her hard work paid off with national attention and, eventually, performances at Radio Disney concert events. After that, additional dates with Kutless, Seventh Day Slumber, Paul Wright, Aoss the Sky and more positioned the emerging artist in front of an even wider audience. Knowing it was time for the next step in her career, Daniels met with several record labels and signed with Midas Records as the company's first faith-based artist. "It’s also important to Daniels to make her own mark on the music world. “My songs capture that rock ambience with a pop edge that I love,” says Daniels. When considering her place in the music scene, Daniels’ hope is to encourage Christians and non-Christians alike with a message that continues to have an impact on her.